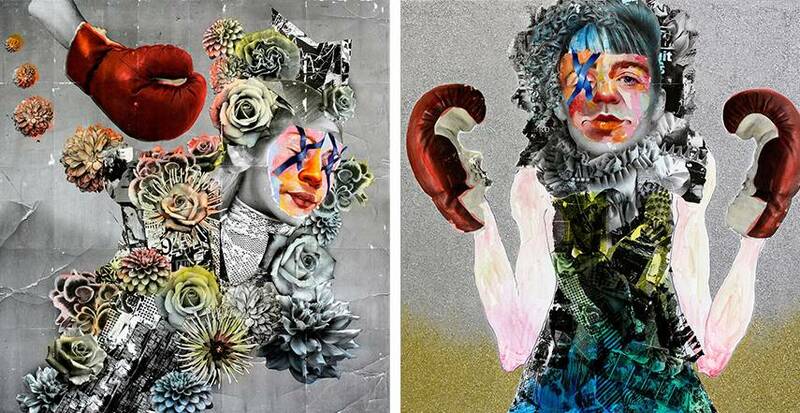 Colorful, impressive portraits of American artist AM DeBrincat bring us back to our childhood and those days when we used to make collages and combine pieces of magazine articles with old photographs. For DeBrincat, who is a multimedia artist, the combination of prints, photographs and colors aims to represent the issue of hybrid identities, which is a modern term, born in the era of smartphones and social media. The digital realm we’re living in made it possible for us to create interactive self-portraits anytime we want and DeBrincat is exploring this phenomenon through her art. DeBrincat is a versatile artist who received a BA in Spanish and English Literature from the University of Oregon and also an MFA from Parsons the New School for Design in NYC. Thanks to her degrees in art and languages, she has a good understanding of the nature of communication, which changed a lot recently because of the rapid digitalization. Not only human communication but also the nature of identity and information changed since the widely accessible social networks and the entire realm of the digital allow us to be, in a way, whatever we decide to be. 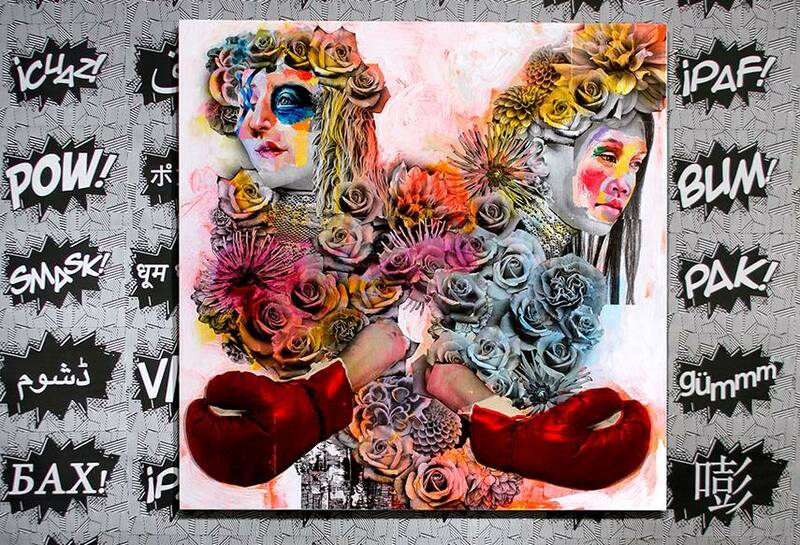 Choosing a different avatar every day has become a common practice and DeBrincat is trying to offer a deeper insight into this idea by creating multimedia works on canvas which are hybrid and merge painting, photography, and printmaking. The artist is also appropriating images from online searches and combining them with the photos she takes while strolling the streets of NYC. Urban details such as graffiti, catalogs and car stickers are commonly found in her collages. De Brincat’s work is based not only on photos and paintings, bus also on a xerox transfer printing. The artist uses this type of transfer printing as the conceptual bridge between digital and real worlds because it enables us to place the digitally constructed entities on a physical plane. Only after this transfer has been done, the artist uses acrylic and oil paints to enhance the photographs and create different faces. Each of these faces is, in fact, a composite of images the artist obtained through social media and various advertising websites. Uniquely constructed and seamed together faces fit perfectly the artist’s idea of composite identities we’re bound to find in every corner of the web nowadays. AM DeBrincat is not only a multimedia artist, but also a writer, curator, and the publisher of Art File Magazine. She is interested in helping her fellow artists get more public exposure and she is investing a lot of efforts in composing in-depth artist interviews and publishing additional projects which can be described as a blend of art and writing. When she is not working on the magazine, De Brincat is spending time in her Brooklyn-based studio, brainstorming new ideas. DeBrincat’s work has been shown in group exhibitions in the US and abroad, and in solo exhibitions in New York City, Los Angeles, Houston and Cleveland. The most important of her recent awards are grants from the Durst Foundation and the Deming Foundation, as well as the fellowship from MASS MoCA Museum. BAU Gallery in Beacon, New York is the host of Power Moves, an immersive site-specific installation and solo exhibition of AM DeBrincat’s work. The opening reception was held on April 9, 2016 and the exhibition will be open for visitors until May 8. Power Moves investigates the relationship between words and actions in our modern, digital age. 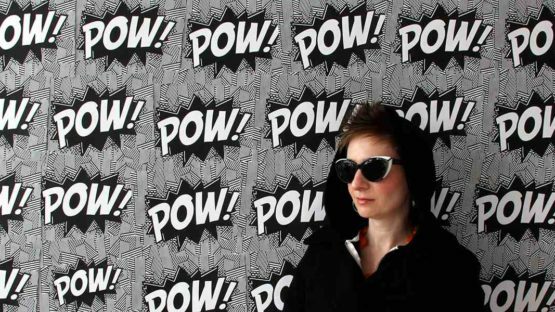 The artist covered the gallery walls with the word for the sound of a punch, represented in twenty-five languages from around the world, alongside with her paintings. Power Moves explores the way we communicate and create our identity in an online world and the frequent motif of boxing gloves stands for the aggressive momentum and anxiety, omnipresent in the Information Age. DeBrincat’s vividly colored paintings and strange complexity of her portraits are guaranteed to capture our attention because we’re simply bound to try to decode and demystify all the layers they contain. At the same time, the ideas behind DeBrincat’s works are as appealing as their visual aspect. Questions of identity are surely a heated topic nowadays and DeBrincat’s enticing approach is perhaps helping us understand a little bit better all the implications of our multiple online identities. AM DeBrincat lives and works in Brooklyn, NYC.